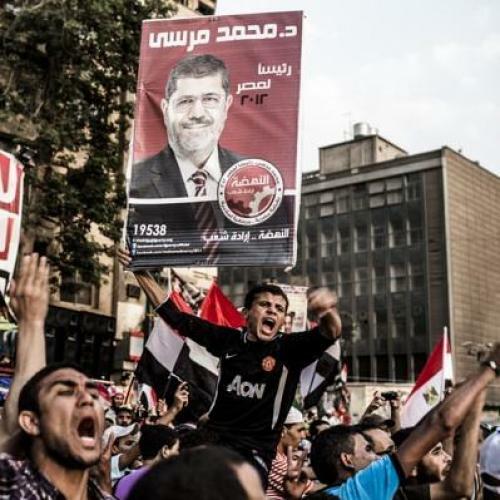 Of course, after a painfully long speech by the presidential elections commission chairman, Muslim Brotherhood leader Mohamed Morsi was declared Egypt’s next president, and massive celebrations soon enveloped downtown Cairo. But the mood of Tahrir Square before this announcement—most of all, the rampant talk of death—suggests that the Muslim Brotherhood and its allies were not prepared to accept any other outcome. They were either going to win the presidency outright, or fight for it via other means. In other words, although the Brotherhood won this election democratically, we shouldn’t conclude that it is a truly democratic organization. Indeed, the Brotherhood’s undemocratic ways were evident throughout the presidential campaign. When they first announced that they would run a candidate in late March, the Brotherhood accused Egypt’s military junta of trying to forge the elections, and said that it would respond to the election of any former regime official with mass demonstrations. “The Egyptians did not revolt to get rid of Mubarak...to get another Mubarak—Shafik or someone,” Murad Mohamed Aly, a Morsi campaign official, told me in April, adding that the Brotherhood would also launch mass protests if former Arab League leader Amr Moussa, then a poll-leading contender, were elected. During the elections, the Brotherhood and its allies similarly resorted to undemocratic maneuvers. The Brotherhood allegedly used its vast, nationwide social services networks to buy votes for Morsi; as the Carter Center, which monitored the vote, acknowledged, “Due to the [Brotherhood’s] long history of providing social support through religious and family networks, it is extremely difficult to distinguish these practices from illicit influence.” Moreover, it was reported that Christians had been prevented from voting in the mid-Nile city of Minya, though the presidential elections commission ultimately decided that it was unclear who was behind this. The results were set to be announced last Thursday. But when the elections commission delayed the release to consider over 100 challenges, the Brotherhood and its allies cried foul and signaled that they would ensure Morsi’s victory by any means necessary. Essam Derbala of al-Gamaa al-Islamiya, a U.S.-designated terrorist organization that endorsed Morsi, told me on Thursday that if Shafik won, “the youth … will see that peaceful demonstrations won’t suffice.” Although Derbala attempted to walk this statement back, he ultimately conceded that general strikes—which would aim to shut down the economy until Shafik fell—were a possibility. The Brotherhood, of course, was far more circumspect in its statements. When I asked Brotherhood political spokesman Ahmed Sobea last Wednesday whether Shafik’s victory would catalyze a new revolt, he replied, “We leave this to the Egyptian people.” But this was dishonest. By Thursday, the Brotherhood was chartering buses to take its members—as well as some non-Brotherhood supporters—from all over Egypt to Tahrir Square. The goal was to send the message that it would not accept any outcome other than Morsi’s presidential victory, and Muslim Brothers were prepared to fight with security forces if Shafik won. Thankfully, none of this anticipated violence came to fruition. But it should not go unnoticed that, in the first presidential election following Egypt’s pro-democratic election, it was the new ruling party—the Muslim Brotherhood—that was preparing for months to reject an electoral outcome against it. By contrast, members of the old, autocratic ruling party, who overwhelmingly endorsed Shafik, swallowed Morsi’s victory without incident. Egypt may have ousted a dictator, but its new rulers will only play by democratic rules so long as they enhance their own power.